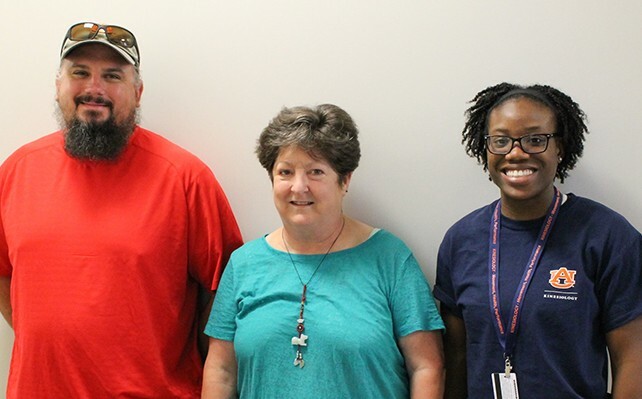 Dr. Alice Buchanan, Associate Professor in the School of Kinesiology and Coordinator of the Physical Education Internship Program, has recently begun a novel research study at the Lee County Youth Development Center (LCYDC) in Opelika to assess and positively impact students’ behavior. Dr. Vanessa Hinton of the Department of Special Education, Rehabilitation, and Counseling is her research partner in this endeavor. LCYDC is a private, non-profit organization initiated over 40 years ago to fulfill the growing need of residential care services for children and adolescents (ages 11-19) who have been abused, neglected, or dependent. Today, LCYDC also supports programs in preventative outreach care, community-based interventions, and home-based therapeutic foster care. Buchanan’s and Hinton’s study focuses on attempting to change the behavior of students by using the Positive Behavior Interventions and Supports (PBIS) model in physical education classes. This model, according to the pbis.org website, is a framework or approach for assisting school personnel in adopting and organizing evidence-based behavioral interventions into an integrated continuum that enhances academic and social behavior outcomes for all students. It encourages positive support and reward, rather than negative reinforcement and punishment. PBIS is a leveled form of instruction consisting of three tiers: primary (80 percent of the students are expected to comply without special support), secondary (15 percent are expected to need more intensive support), and tertiary (5 percent are expected to need this very intensive support). Each level increases in intensity and specialization toward the individual, while still focusing on positive behavior. At LCYDC, behavior is measured and rewarded based on the students’ cooperation, respect, preparation, participation, and quality of work. The goal of the study is to determine whether the model more effectively fosters sufficient behavioral change to accomplish students’ full integration into society, the ultimate goal of LCYDC. Buchanan’s and Hinton’s research team includes Andy Stringfellow, a first-year Ph.D. student in Physical Education Teacher Education, and Natasha Jones, a first-year Master’s student in Physical Activity and Health. Both Stringfellow and Jones teach physical education classes at LCYDC three to four days per week. Each class consists of 3 to 15 students participating in activities such as fitness, basketball, football, and volleyball. LCYDC has about 75 total students at any one time. Some students stay at the Center for a few days, while others stay for several months or even a couple of years. Stringfellow has been working with the organization since January 2015 and is interested to see how the PBIS model will affect student behavior. Jones has only been working with LCYDC for three weeks and is anticipating positive changes using the PBIS model. Dr. Buchanan commented that both of the physical educators really care and have good rapport with the students. This research stemmed from PBIS workshops that Buchanan and Dr. Hinton conducted in 2013, funded by a one-year, $20,000 outreach grant. PBIS has been used in classrooms, but Buchanan and Hinton have published two of the only three papers published on PBIS in P.E. Under Buchanan’s supervision, School of Kinesiology graduate students have been teaching physical education at LCYDC for at least 15 years, but this is the first research project that has been conducted. In fact, this is the first research from Auburn University in recent years that has been approved to be conducted at LCYDC. The PBIS project at LCYDC began this semester and will continue indefinitely. The researchers are continually developing standards of measurement and establishing reliability for their study. They would like to measure if PBIS impacts activity time and daily step count, as well as apply for a second IRB to interview the students and receive qualitative feedback. For more information about the program, contact Dr. Alice Buchanan at buchaa2@auburn.edu. Visit www.lcydc.org for more information about the LCYDC organization, or www.pbis.org for more information about the PBIS model.